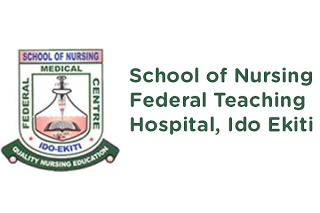 Applications are invited from sutably qualified candidate for admission into the School Of Nursing Federal Teaching Hospital, Ido Ekiti for the 2017/2018 Sessions. Candidates must possess a minimum of Five Credits in WAEC/SSCE/NECO to include English Language, Mathematics, Biology, Chemistry, and Physics at not more than two sittings. Age: Candidate's age should not be less than seventeen (17) years. 2. With the pin number obtained from the bank, visit www.sonfthidoekiti.com to fill the on-line admission application form. 3. Candidates should print a photo card from the website on successful completion of the admission application. 4. Candidates should come along with his/her photo card on the day of the examination. The Application Form is NINE THOUSAND FIVE HUNDRED NAIRA ONLY (N9,500.00). Payable at any Commerical bank in Nigeria. Online application must be completed on or before Wednesday, 16th August, 2017. Examination holds on Saturday, 19th August, 2017 by 9.00am. Please contact the office of the Principal, School of Nursing, Federal Teaching Hospital, Ido-Ekiti. NOTE: NO PAYMENT SHOULD BE MADE TO ANY INDIVIDUAL/AGENT OR PERSONAL BANK ACCOUNT. PAY DIRECTLY TO ANY COMMERCIAL BANK AND OBTAIN YOUR PIN AND THEREAFTER, COMPLETE YOUR APPLICATION ON-LINE.